The United Nations said Thursday that it is temporarily relocating more than half its staff in Afghanistan following last week's deadly Taliban attack against U.N. workers. The U.N. mission is still reeling from a pre-dawn assault on a guesthouse in the capital last week that left five U.N. staffers dead. The Kabul attack was the most direct targeting of U.N. employees during the organization's decades of work in the country. Some 600 nonessential staffers will be moved for four to five weeks to more secure locations in and outside of Afghanistan while the body works to find safer permanent housing, spokesman Aleem Siddique said. The majority of the U.N.'s 1,100 international staff in Afghanistan live the capital, spread out among more than 90 guesthouses. The plan is to consolidate those living arrangements so staff can be better protected, Siddique said. He stressed this was not a pullout or a scale-down in operations. About 80 percent of the U.N.'s staff in Afghanistan are Afghan citizens. "We've been here for over half a century and we're not about to go any time soon," Siddique said. In the Oct. 28 attack, gunmen wearing suicide vests stormed a private guesthouse where dozens of U.N. staffers lived, killing five U.N. workers and three Afghans. The Taliban claimed responsibility for the assault, saying they intentionally targeted U.N. employees working on the recent presidential election. Much U.N. work in Afghanistan has been put on hold since the attack and employees have been given the option to take leave while officials consider how to better protect employees. The move comes on the heels of a U.N. decision to suspend much of its work in the volatile northwest of neighboring Pakistan because of increasingly targeted attacks. Though the U.N. insists it is committed to the region, its actions show how much security has degraded in the two countries and raise questions about the future of the U.N. in the area. 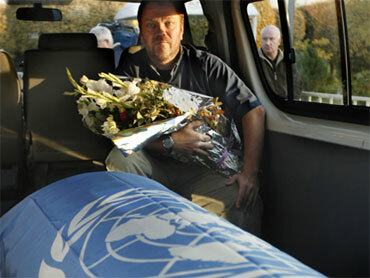 In Iraq, a series of attacks on U.N. workers led the world body to shut down operations in 2003 for years.